This long embroidered scroll is the most important relic to survive from the 11th century. Students can see – in comic-strip type scenes – the epic story of William of Normandy’s conquest of England in 1066, and consider the French and British interpretation of events. Bayeux is a medieval town with shops, mills and historic architecture. Tip: A workbook is available in French for MFL students. A workspace can be pre-booked for one hour for school groups with a replica tapestry image. The new Arromanches 360 film co-financed by the Region Basse-Normandie and the Memorial de Caen was produced by the authors of the hugely successful French television series, Apocalypse. This film is projected in High Definition on 9 screens and tells the story of the terrible Battle of Normandy thanks to archive images gathered from around the world. This film is a tribute to soldiers from all countries and to the 20,000 civilians who were killed during this battle for the liberation of Europe, a battle which gave rise to so much hope. The Normandy American Cemetery and Memorial covers 172.5 acres and contains the graves of 9,387 military dead, most of whom lost their lives in the D-Day landings and ensuing operations. The memorial, set around a bronze statue, shows maps and narratives of the military operations. Visitors’ centre staff are available to answer students’ questions. Tour the newly refurbished traditional Normandy Caramels factory in Isigny. A guide will take you on a tour of the room overlooking the factory floor displaying the process of soft toffee making. There will also be the chance to buy the caramel products from the souvenir shop next door. This is a good opportunity to see how the tourist industry supports the existence of local production businesses. The German artillery battery at Longues-sur-Mer, part of the Atlantic Wall coastal fortifications, was destroyed by Allied forces on 6th June 1944. Made up of 4 block houses and an observation post looking out to the sea, this is the only battery with its guns still intact. Longues-sur-Mer is one of the most important parts of the Historical Route of the Battle of Normandy at the heart of the allied assault sector between Omaha and Gold Landing Beaches. This museum which opened in May 2016 in Falaise is unique as it is dedicated entirely to the daily life and survival of civilians during World War Two in Normandy. Built on the ruins of a house which was destroyed by the bombs of summer 1944 exhibits include film, photographs, oral testimonies from civilians, and objects from the period. An immersive film plunges the visitor into the bombings of WWII and the museum also looks at the period of Occupation in Normandy. Trouville’s sister resort Deauville is the most sophisticated resort on the Normandy coast complete with race course, film festival, casino and its own airport. Deauville inspired many artists: painters, writers, poets and caricaturists who came here during the 1920’s including Coco Chanel, who opened one of her first boutiques here, Dufy, Fujita, Van Dongen, Apollinaire, Sacha Guitry and Colette. This quality artisan chocolaterie close to Deauville allows students an insider view into how chocolate is made and why it tastes so delicious. A master chocolatier gives a historical and geographical account of the chocolate making process. There is a demonstration of chocolate being moulded and chocolate covered specialities. Students also get to test the product and there is a gift shop for present buying. Aimed at groups travelling to Normandy to improve their students’ French language skills, this trail sees students engage in a spy-themed adventure. Students will work within their teams to complete numerous tasks at various locations around the region. The adventure can be customised around a number of key sites stretching from the Bayeux Tapestry to Arromanches and Mont St Michel before culminating in a final race within the grounds of the Château du Molay to uncover the hidden cache. You can choose from a range of fun and educational activities and experienced château staff are on hand to ensure that the students are having fun all day and night. Château activities can include: archery, a blind trail walk, survival skills, initiative exercises, using various sports facilities for sporting games (such as the seasonal outdoor swimming pool), plant a tree eco avenue activity and circus frenzy to name a few. Extend the cultural experience for your students with a spy-themed adventure in Normandy. The English language task will not only develop students’ ability to communicate and solve problems, but see them engage with a series of challenges at key sites around Normandy, including Bayeux and Arromanches. Students will then head back to the Château du Molay for a final race to uncover the hidden cache. Take a trip along the Cider Route with its châteaux, manors, half-timbered houses and apple orchards. This is the heart of the zone known as the Appellation d’Origine Contrôlée des Cidres du Pays d’Auge and links about 19 local producers – recognisable by the signpost Cru de Cambremer. They welcome visitors, offering a guided cellar tour and tastings. This is a hands-on goat farm that allows students to see how dairy products such as milk and cheese are produced. Students can play with the goats and take part in the milking process. It’s a great way to find out more about the traditional produce of the area and also presents a good chance to practice language skills and develop vocabulary. Students will enjoy an engaging language experience among some of the historic sights of this charming French town. Teams undertake a series of challenges in different ‘zones’ along the route. Based on the idea of the Apprentice TV programme, students are set a series of fun tasks to earn points for their team as they strive to prove themselves the best all-round competitors and linguists. This challenge has been devised and written for Travelbound groups by the specialist company E3 Trails. In the former Episcopal Palace of Bayeux this museum takes you on a journey through time from archaeology to modern art. Exhibits include archaeological and ethnographical finds, Bayeux porcelain and lace and 350 pieces of art including works by Caillebotte, Van Dougen and Boudin. Students discover major events of the 20th century, from the end of World War I to the fall of the Berlin Wall via exhibits in this large museum dedicated to peace. The Memorial is a rich teaching aid to help students study our shared past and introduces emotion and memory, using dynamic and diverse educational activities. There is a new optional guided tour of just the sections concerned with the D Day Landings and the Battle of Normandy, taking 1 hour 15 minutes. View the Caen Memorial video. After visiting the museum it is possible to book a guide at a supplement to accompany the group on their coach to see the battlefield sites for 3.5 or 5 hours. Optional workbooks and workshops are also available. This huge German artillery battery near Omaha beach lay hidden for over 60 years as it was buried following the US Rangers’ final assault on 9 June 1944. Students can explore over two miles of original trenches, bunkers and see German field guns in position. It is one of the most intact positions along Hitler’s Atlantic Wall in Normandy. Tip: Not many historical accounts of Maisy exist as, to the Germans, it was top secret! This modern museum built inside William the Conqueror’s Castle contains works from the 15th century to the contemporary period. The Museum specialises in 16th and 17th century European painting including works by Veronese, Tintoretto and Rubens. Normandy as the home of Impressionism is represented through works by Monet, Boudin and Lebourg and post impressionism works by Bonnard and Dufy. Our exclusive 18th century Château du Molay can accommodate 195 guests in 42 en-suite bedrooms and is set amongst 38 acres of beautiful private parkland. 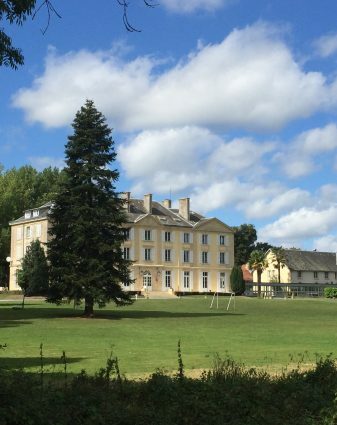 Located only 14kms from Bayeux, within easy reach of the world famous Calvados coast and just a 45 minute journey from Caen, the Château is in an ideal location for easy school trips from the UK.